The Blackout Buddy now has a new EASY fix system with velcro tab attachments. The curtain will easily attach to a window/window frame or door and be adapted to fit most window sizes. The curtains have been designed to overlap window frames to eliminate the light that somehow manages to creep around the edge of a regular blind or curtain. The curtains are made from a lightweight durable ripstop fabric and can easily be installed, removed and stored, making them an excellent product to use at home or when you travel. Easy to Fit and remove. Velcro tab close fit system eliminates 100% light guaranteed. Can be attached to window frames, door frames and windows. Overlapping eliminates light creep from the edge of windows. 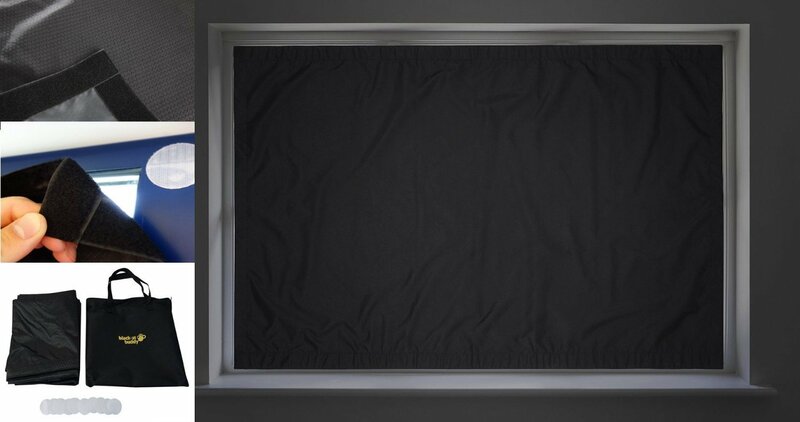 Regular sized Blackout curtain 1.2m x 1m can be orientated either way, and cut to size if required. Lightweight ripstop PU material. Easy to Fit, Easy to Remove. Perfect for travel or baby nursery. NO rubber suckers that dry out and fall off. These curtains are guaranteed to stay in play as long as you like.